If a game was always going to be run on the same device and at the same resolution, positioning controls would be a simple matter of setting the position and size of each one of them. Unfortunately, that is rarely the case. Only TVs nowadays have a standard resolution and aspect ratio. Everything else, from computer monitors to tablets, portable consoles and mobile phones have different resolutions and aspect ratios. There are several ways to handle this, but for now, let’s just imagine that the screen resolution has changed and the controls need to be re-positioned. Some will need to follow the bottom of the screen, others the top of the screen, or maybe the right or left margins. This is done by editing the margin properties of controls. Each control has four margins: left, right, bottom and top. By default, all of them represent a distance in pixels relative to the top-left corner of the parent control or (in case there is no parent control) the viewport. 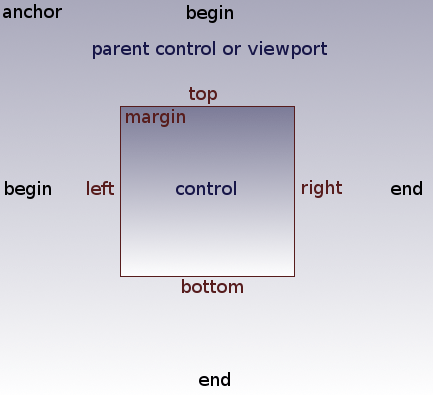 When horizontal (left,right) and/or vertical (top,bottom) anchors are changed to 1, the margin values become relative to the bottom-right corner of the parent control or viewport.